Performers include: Catherine Bell, Bailee Madison, James Denton, Catherine Disher, Anthony Lemke, Peter MacNeill, and Kylee Evans. This fantasy dramedy TV show is based on the series of made-for-TV-movies of the same name. Widowed Cassandra “Cassie” Nightingale (Catherine Bell) is a good-hearted enchantress who lives in the community of Middleton. She lives with her young-teenage daughter Grace (Bailee Madison), who shares the same special intuition as her mom. Their lives get even more interesting when curmudgeonly and divorced doctor Sam Radford (James Denton) and his troublesome son Nick (Rhys Matthew Bond) move in next to the Grey House from New York. They are immediately spellbound by the mother-daughter duo next door, but Sam and Cassie quickly find they don’t see eye to eye. Stephanie (Kylee Evans), the owner of a local bistro, is smitten with the town’s new doctor. George O’Hanrahan (Peter MacNeill) is the father of Cassie’s late husband’s late first wife, — whom Grace calls Grandpa — and new police officer Brandon Russell (Dan Jeannotte) is Cassie’s step-son. Martha Tinsdale (Catherine Disher) is the town’s mayor and Derek Sanders (Noah Cappe) is the chief of police. With her signature charm, Cassie attempts to bring everyone together, ensuring all of Middleton is in for big surprises and a little bit of magic. What do you think? 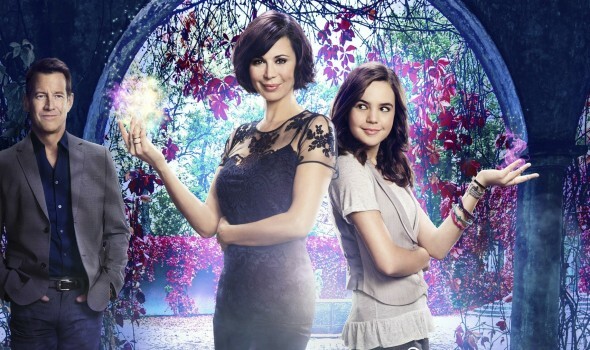 Do you like the Good Witch TV show? Do you think it should be cancelled or renewed for another season? Please keep Good Witch!! It is my favorite show!!! the Good Witch is just one of my hallmark shows. I LOVE IT!!!! I discovered “Good Witch” by accident on Netflix. I fell in LOVE with the program. I have purchased ALL the videos, including season 4 and 5. If there is a season 6,7,etc. I will purchase every video. Catherine Bell is outstanding. PLEASE DON’T CANCEL the show. The ratings are NOT everything. I love the Good Witch. I’ve seen every episode. I don’t want to see it end. This show gives us a good feeling. Love Cassie Nightingale! I want to see more of Good Witch. I have watched every episode. Cassie Nightingale really makes the show special? I love this show….we need more like this. PLEASE leave it on for a long time!!!!! The Good Witch is entertaining. I enjoy the series because it is well written…it is “Charming”no violence, magical and fun. I am so tired of all the violence and heavy handed shows. It is about time tv viewers have a choice.